Nowhere is Denham's motto, "Worship tradition, destroy convention," more apparent than its "ReCut" collection, a series of workhorse garments cobbled together from vintage and repurposed textiles. The latest piece to emerge from the Amsterdam-label's workshop is a twist on an oldie-but-goodie: the Swedish Army coat (circa 1940s to 1970s) that Denham praises for its "rugged texture, thick collar facing, tab-and-toggle closure, and generous map-sized lower pockets." 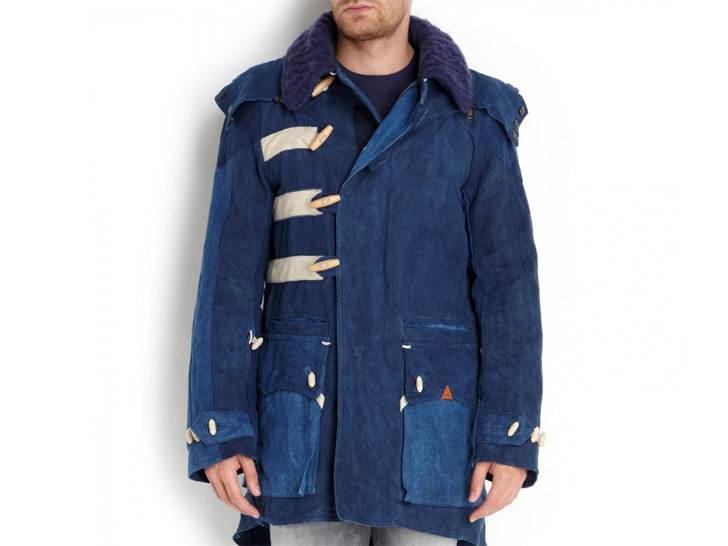 Its contemporary update, the "Orkney DGL," is a hardwearing men's parka crafted from vintage French linen slipcovers and deadstock Italian Navy blankets from the 1960s. It's also the 10th iteration of the company's ReCut concept. Denham’s designers took their inspiration seriously. After locating two examples of the coat—one at the Rose Bowl Flea Market in California and the other at an annual fair for military buffs in Kent, England—they dismantled one of them to learn more about its design and construction. The fabrics themselves came from a stall at War & Peace’s 2011 outing. “The dealer in question charmed us with her personality first, and then did us the favor or allowing us to preview her secret stash of history-rich vintage materials,” the design team says. Inspired by “denimcraft”—Denham’s tent-pole product is its jeans—the company decided to dip-dye the fabrics by hand. The ladies are also welcome to a piece of the action. Denham used the same materials to create a version of its popular “Trouper” fishtail parka for women. Denham's designers took their inspiration seriously. After locating two examples of the coat—one at the Rose Bowl Flea Market in California and the other at an annual fair for military buffs in Kent, England—they dismantled one of them to learn more about its design and construction. The fabrics themselves came from a stall at War & Peace's 2011 outing. "The dealer in question charmed us with her personality first, and then did us the favor or allowing us to preview her secret stash of history-rich vintage materials," the design team says. 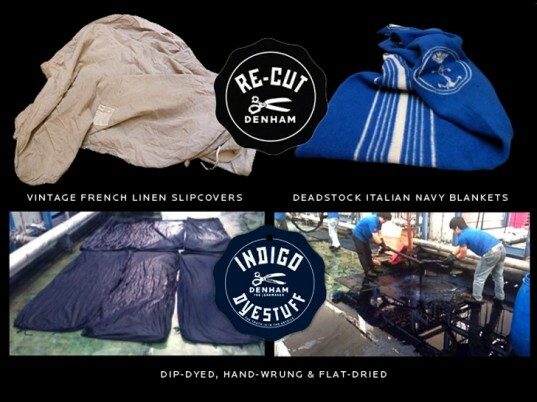 Inspired by "denimcraft"—Denham's tent-pole product is its jeans—the company decided to dip-dye the fabrics by hand. Sections of linen were laid down in indigo baths, pulled out, then manually wrung and dried flat to create a "one-of-a-kind optic loaded with rich highs and low textures." Denham used the same materials to create a version of its popular "Trouper" fishtail parka for women.